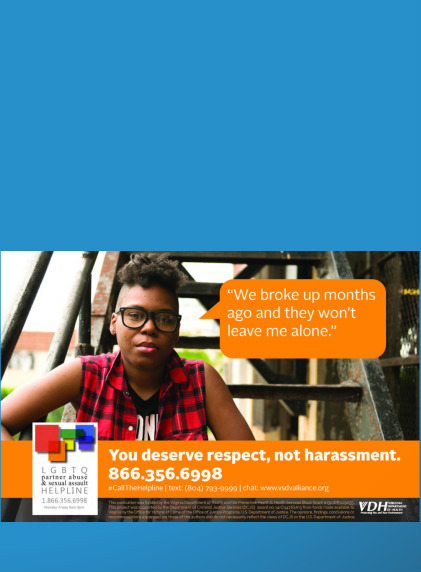 The LGBTQ Helpline Campaign features different expressions of intimate partner violence (IPV) or sexual assault in LGBTQ relationships and encourages people who are experiencing violence in their lives to call the LGBTQ Partner Abuse & Sexual Assault Helpline, a confidential resource offering support, referrals, information, safety planning, and validation. The Action Alliance began testing LGBTQ Helpline campaign strategies in Metro Richmond in April 2015. Campaign strategies include: distributing packages of posters, pens, magnets, stickers and other marketing materials to targeted groups in Richmond (e.g. community centers, clubs, and college campuses), placing exterior and interior ads on Richmond public transportation, and gathering data to determine effective social media strategies. information, and resources to survivors, friends, family, and helping professionals. The Helpline may be contacted by phone, chat or text 24 hours a day. 1 Walters, M.L., Chen J., & Breiding, M.J. (2013). The National Intimate Partner and Sexual Violence Survey (NISVS): 2010 Findings on Victimization by Sexual Orientation. Atlanta, GA: National Center for Injury Prevention and Control, Centers for Disease Control and Prevention. 2 “NCAVP Endorses Intimate Partner Violence Awareness Month; Calls for End to LGBTQ and HIV-Affected Intimate Partner Violence”. National Coalition of Anti-Violence Programs Alert. October 16th, 2014.